For years studies have suggested that eating blueberries and other berries is good for our health (here, here, and here). Now another study suggests that eating wild blueberries benefits children's thinking, specifically attention and "executive function" (mental processes which lets people plan, organize, and complete tasks). What was nice in this study was that it was "double-blind"- which meant that biases couldn't influence the results. Flavonoids are a diverse group of phytonutrients (plant chemicals) found in almost all fruits and vegetables. They are powerful antioxidants with anti-inflammatory and immune system benefits. And yes, other studies have also found various benefits to mental processes with an increase of flavonoids in the diet - in both children and adults. Primary school children could show better attention by consuming flavonoid-rich blueberries, following a study conducted by the University of Reading. In a paper published in Food & Function, a group of 7-10 year olds who consumed a drink containing wild blueberries or a matched placebo and were tested on their speed and accuracy in completing an executive task function on a computer.The double blind trial found that the children who consumed the flavonoid-rich blueberry drink had 9% quicker reaction times on the test without any sacrifice of accuracy. In particular, the effect was more noticeable as the tests got harder. Previous [Univ. of] Reading research has shown that consuming wild blueberries can improve mood in children and young people, simple memory recall in primary school children, and that other flavonoid rich drinks such as orange juice, can also improve memory and concentration. The following is a list of nutrients that some researchers (from the Institute of Food Technology) think of as especially beneficial to the brain. Other researchers may (or probably will) focus on other nutrients. I am posting it even though I generally dislike articles that talk about "superfoods" or an itemized list of foods that one should eat to the exclusion of others. Because, of course, focusing on some nutrients may leave out many just as important nutrients. 2. Omega-3 Fatty Acids: Omega-3 fatty acids have long been shown to contribute to good heart health are now playing a role in cognitive health as well....Foods rich in omega-3s include salmon, flaxseed oil, and chia seeds. Just one cup of blueberries per day could be the key to reducing blood pressure and arterial stiffness, both of which are associated with cardiovascular disease. .... Johnson said she is interested in looking at how functional foods -- foods that have a positive impact on health beyond basic nutrition -- can prevent and reverse negative health outcomes, particularly for postmenopausal women. Over an eight-week period, 48 postmenopausal women with pre- and stage-1 hypertension were randomly assigned to receive either 22 grams of freeze-dried blueberry powder -- the equivalent to one cup of fresh blueberries -- or 22 grams of a placebo powder. Participants, meanwhile, continued their normal diet and exercise routines. 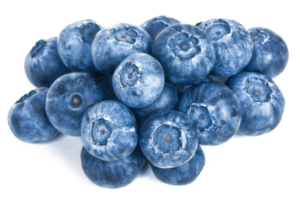 Additionally, participants in the blueberry-treated group had an average reduction of 97 cm/second (6.5 percent) in arterial stiffness.They also found that nitric oxide, a blood biomarker known to be involved in the widening of blood vessels, increased by 68.5 percent. That is important, Johnson said, because arterial stiffness and the narrowing of blood vessels are both a part of hypertension. This rise in nitric oxide helps explain the reductions in blood pressure.